There is nothing more intoxicating and alluring than freedom. 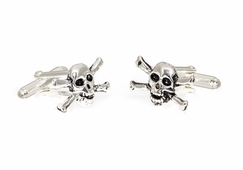 You can exercise your freedom with the symbol of rebellion by wearing skull cufflinks of various designs which include everything from swords and pirates to crossbones just like with the jolly rodger flag. 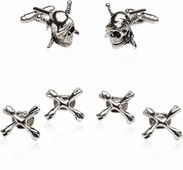 Wear these little items and see how people pay attention to your gently hidden wild and free nature. 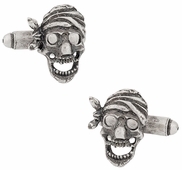 If you are a more of a personal freedom seeker then you can pass on skull-themed links and instead go for a skull pendant. 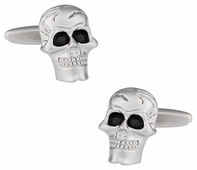 These can be worn under your clothes to be whipped out at just the right moment. The moment when you don’t mind showing who you are to someone close. 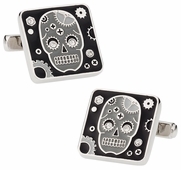 The collection ranges from unique designs to established pop themes and includes cufflinks and pendants made from a wide variety of materials. There are diamond plate designs, steel designs, sterling silver designs, and even gold designs for those who live life king size. 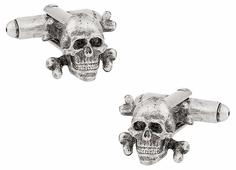 Ahh, the ubiquitous skull & crossbones can't be missed in fashion today. 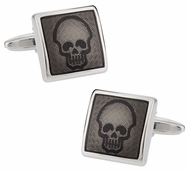 That's why here at Cuff-Daddy.com we are proud sellers of many skull cufflinks. 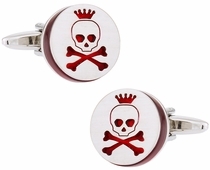 Just open any fashion magazine or blog and you'll find skull & crossbones on the catwalk or in many haute couture designs. Are we obsessed with death? 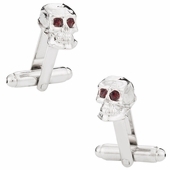 Or do we know what makes a cool fashion statement. You be the judge! 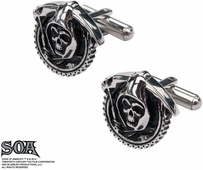 Either way, when it comes to skull and crossbone cufflinks you can count on Cuff-Daddy to bring you innovative designs at a fraction of the price of what you'll find in any retail store. 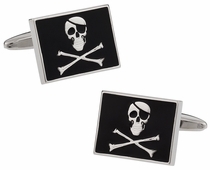 So, stop settling on what cufflinks you can find in a strip mall, and browse Cuff-Daddy's complete selection of over 2,000 unique cufflinks. Take advantage of our low price guarantee and top-notch customer service. Most customers come back time and time again. 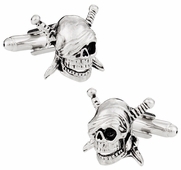 Skull Cufflinks: Skulls are very much a part of the modern youth culture. In fact, it has grown so popular that it has now moved beyond just the gothic circles. High fashion now boasts of skull motifs and many top class designers have adopted it. 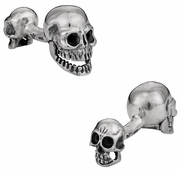 You can be at the forefront of skull fashion with the skull cufflinks at Cuff-daddy.com.